After Steven Mumford's death in 1707 there were many waterings down and changes which started to take place in their fundamental beliefs. On March 2, 1708 they apparently changed their observance of Passover from the yearly Bible observance of it on the 14th of Nisan to a monthly or bimonthly event. Here is a quote from their Church minutes: "it is ordered and appointed that the last Sabbath in every month, the time of breaking of bread, it is also agreed that if by reason of the season, or otherwise the Church neglect the breaking of bread at any of the times appointed, then they shall break bread the next Sabbath after, except at the time of the yearly meeting." I.e., they appointed a time each month to observe 'The Lord's Supper', or Passover. This is the 1st appearance of this in any of their records, one year after Steven Mumford's death. As of 1708, Rachel Langeworthy was the only one of the original 7 still alive. They now had 40 members and Will Gibson was their minister. Roswell F. Cottrell. He descended from a long line of Sabbath-keepers; the Cottrells were an Albigensian family or clan of southwestern France….The Cottrell family of England was descended from John Cottrell the Norman, one of the few survivors of the devastating Albigensian Crusades. 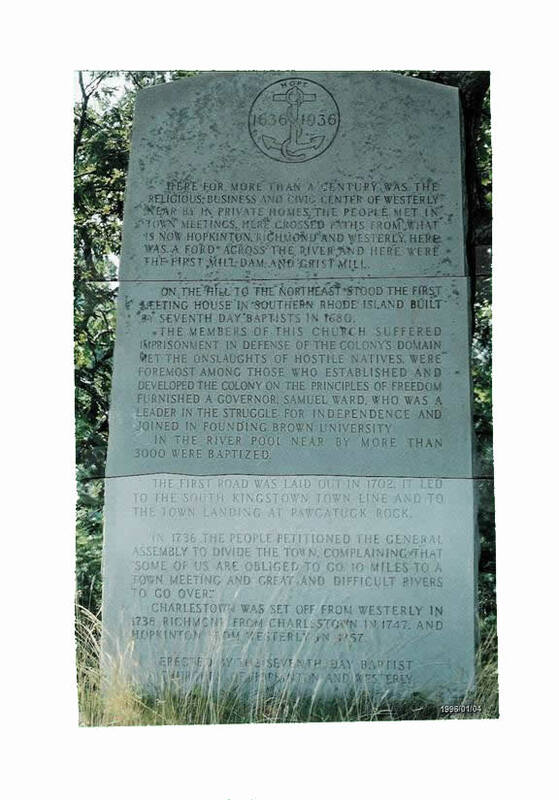 In 1638 (two years after Rhode Island plantation was founded by Roger Williams), Nicholas Cottrell came from England and settled in Rhode Island . The Cottrell name is found among the earliest Church of God people (later Seventh Day Baptist) people in America . John Cottrell was a member of the “mother” church in Newport , Rhode Island in 1692. Nicholas and Dorothy Cottrell were members of the Westerly Church ( Rhode Island ) in November 1712. After photographing the old cemetery, and then their meeting house that held 2,000 members in Hopkinton , Rhode Island , while driving away from it toward Route 95 we passed either a mansion or plantation with the name Cottrell on it, and it was owned by the local historical society. This may have been the property of the children of Nicholas and Dorothy Cottrell, or maybe their actual dwelling. We didn’t have time to stop, as it was running late. We had searched in vain for their tombstone. 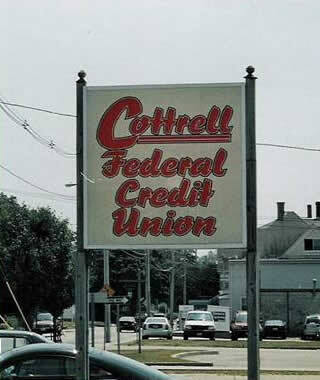 But the Cottrell presence was all over Westerly , Rhode Island . In 300 years one family can grow large. We’ll get back to the Cottrell’s a little bit later, as they provide a very interesting connective thread between the Waldensian era, all the way to the Church of God Seventh Day (headquartered in Stanberry, Missouri), which denomination Mr. Herbert Armstrong was a minister in for a brief period of time. They’re an interesting family, to say the least. 1715/16: Joseph Crandall was ordained a minister. In the written record of the ordination ceremony it stated, "Being an example to the flock, and when the chosen Shepherd shall appear you shall receive a crown of glory that fades not away." They still believed in the resurrection to Immortality at Christ's 2nd Coming, and not the 'doctrine' of going to heaven when one died. 1729: In 1729 they built their first meeting-house, in Newport , Rhode Island . They called the buildings they met in 'meeting-houses' and called themselves 'the Church', 'Sabbath-keepers', or simply 'The Church of God'. All the Sabbath-keeping meeting-houses followed this style. Up until 1882, this building and all their buildings had no steeples or crosses. It had a pulpit and front door right next each other. If you were late everyone knew it. There was no way to sneak in. This building held 45 people, and the highest Newport attendance reached 75 people. It has really fine carvings and woodwork and is now a part of the back of the Newport Historical Society Building . “The meeting house had twenty-four box pews on two levels. The main floor had four in a cluster in the center, four along the west wall, three along the east wall, one on the right of the pulpit against the north wall, and one on either side of the front entrance. The pew box to the right of the entrance was reserved for strangers. In the gallery there were four smaller boxes along the railing on the west side, three along the middle section, and three along the east gallery railing. 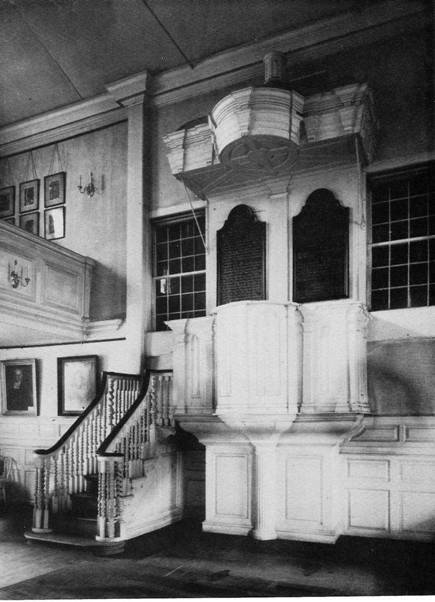 The stairway to the gallery occupied the southwest corner of the meeting house. 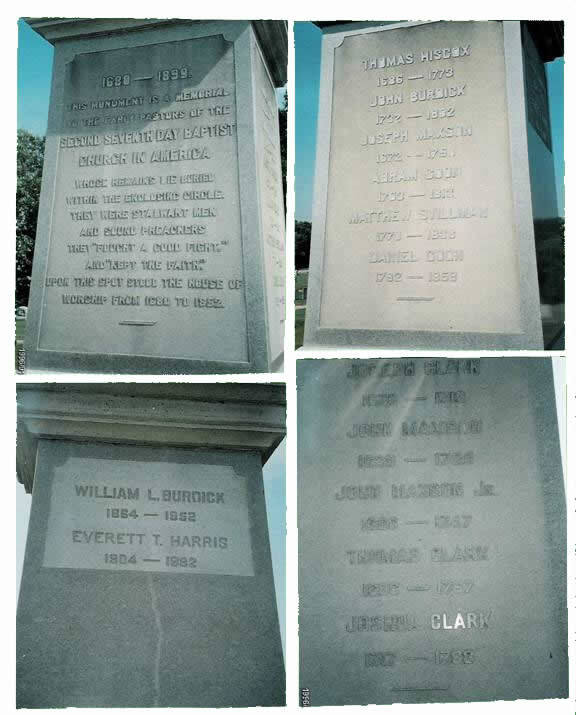 There is no known record of the names of the pew holders, but as indicated by Maud Howe Elliot, the Ward family had a reserved pew and other prominent families certainly followed the common practice of renting or even buying their pew space. 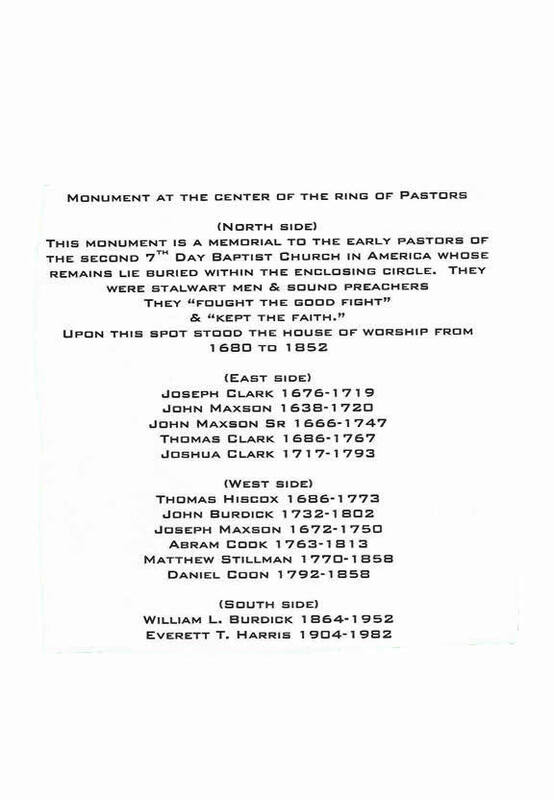 One report indicates that the pews “in the east gallery were occupied by colored people.” The church records contain the names of a number of African-Americans and Indians who were baptized and accepted as full members of the church. For even today may be plainly seen initials carved in the railing. This was not because the pastor lacked knowledge of the fleeting hours, for there was before his very eyes hung the clock made by William Clagget, a worthy member of the Sabbatarian congregation in 1731 and an excellent clock maker of that period. That clock still hangs on the center balcony railing of the Meeting House.” [ibid. pp. 32-33, par. 2-3, & 1 resp. 1740's: It was during the 1740's that both Richard and Samuel Ward were Governors of Rhode Island. The Church is quick to claim them as members as they started seeking credibility in the world's eyes, but Richard Ward didn't become a baptized member up until 9 years before he died, (1754), long after he was out of political office and politics, reflecting the Church's belief in that baptized members should have nothing to do with politics. Richard Ward died in 1754. 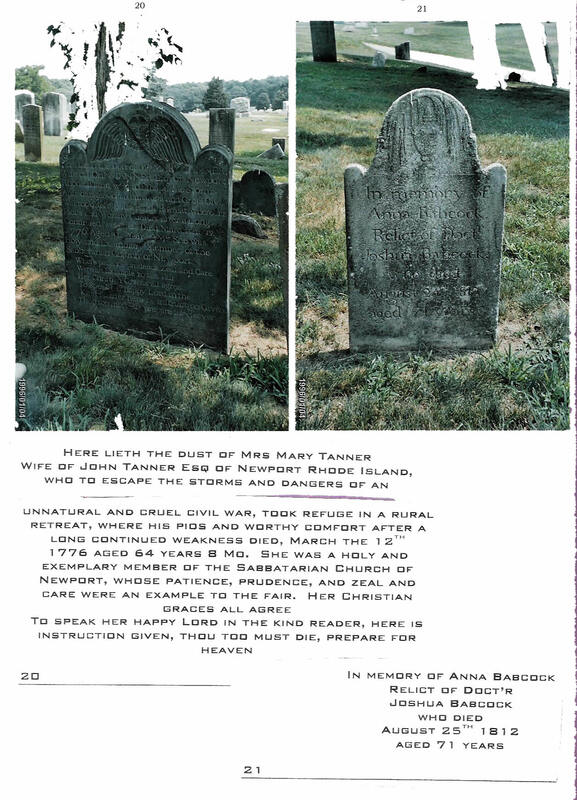 Mary Ward, his wife was a baptized member for 55 years (1713-1768) and died October 19, 1768. 1765: A college was founded in 1765 called ' Rhode Island College ', in Warren , Rhode Island . It was founded by 7 men, 4 of which were Sabbath-keepers. They were: Sam Ward, Joshua Babcock, Joshua Clark (the pastor in Westerly ), and Job Bennet. The college was originally founded to preserve religious freedom. Today the college is Browne University located in Providence , Rhode Island . It has 2 fine libraries where some of our research was done. They are the Rockefeller Library and the John Haye Library. It was in 1770 that the college was moved to Providence and renamed Browne University . 1780's: The Church of God in Newport dies out, but it had moved westward to Westerly and Hopkinton , Rhode Island . The photo above is a small former Sabbatarian meeting-house we found opposite Hopkinton Post Office, on the same road that leads to their much larger meeting house in Hopkinton. 1680: In 1680 a little north of Westerly , with 20 members, they built a building (meeting-house) that would hold 1,000 people. This Church preceded the building of the town of Hopkinton , Rhode Island . They founded that town. They continued to call themselves 'The Church', or 'The Church of God', or the ' Sabbatarian Church ,' but never registered their name. They refused to register their name (i.e., have an official name) because to have an official name, they felt, would mean that they would have to seek sanctions from the State, because they felt they had a higher sanction, and that was from God. That is why they never registered their name. They simply called themselves 'The Church', 'The Church of God', or 'The Sabbatarian Church'. 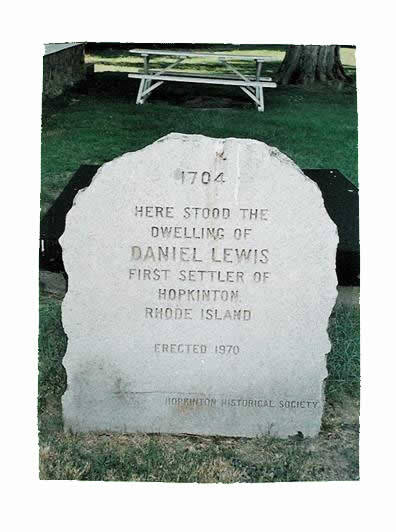 1757: In 1757 the town of Hopkinton was founded. [The year Fort William Henry was burned to the ground by the French at Lake George . (See historical note, page 55.] 90% of its' inhabitants were Sabbath-keepers. These Sabbath-keepers founded that town. 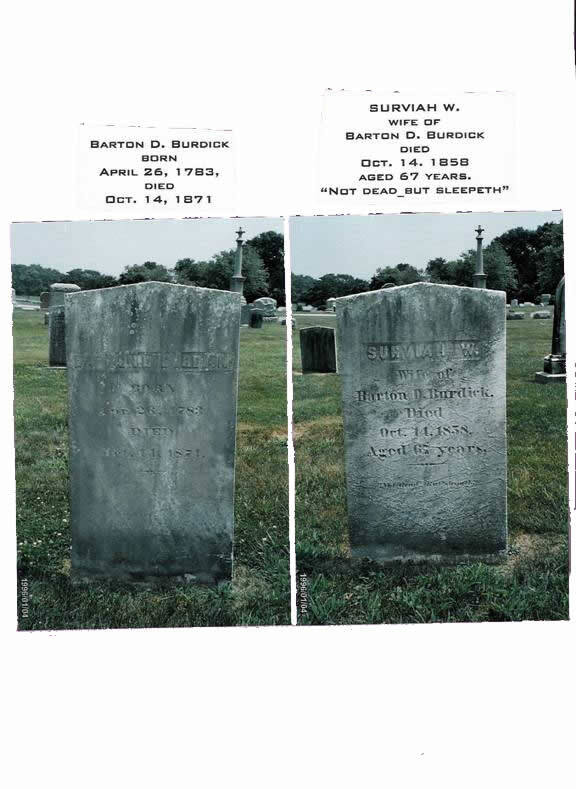 Sarah Mumford, granddaughter of Steven Mumford, is buried in the area. We found this plaque next to the main Church building in Hopkinton, the one that was built to hold 2,000 members. 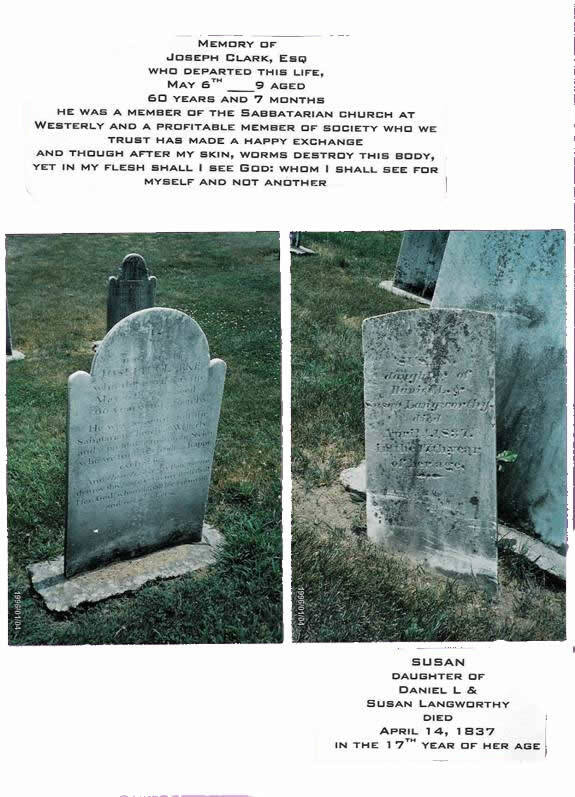 1812: Dr. Joshua Babcock, member of the Church, and friend of Benjamin Franklin, died. 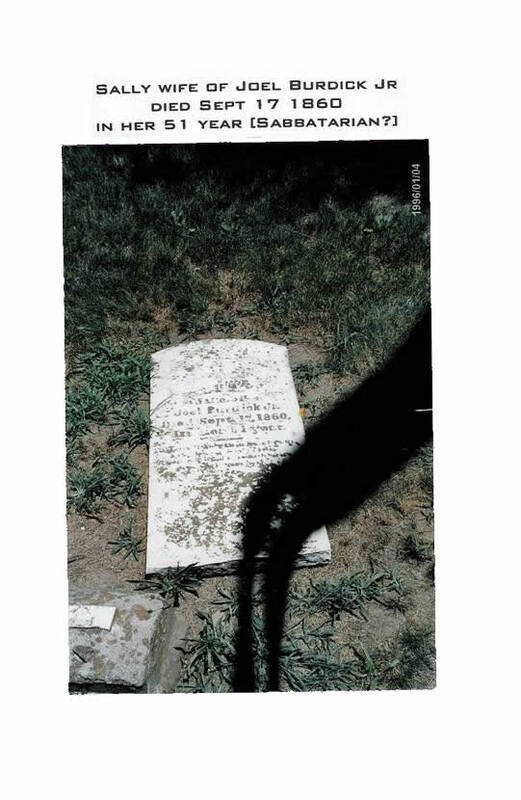 His friendship with Franklin caused the rumor to take root that Franklin was a Sabbath-keeper. Ben Franklin was never a Sabbath-keeper. 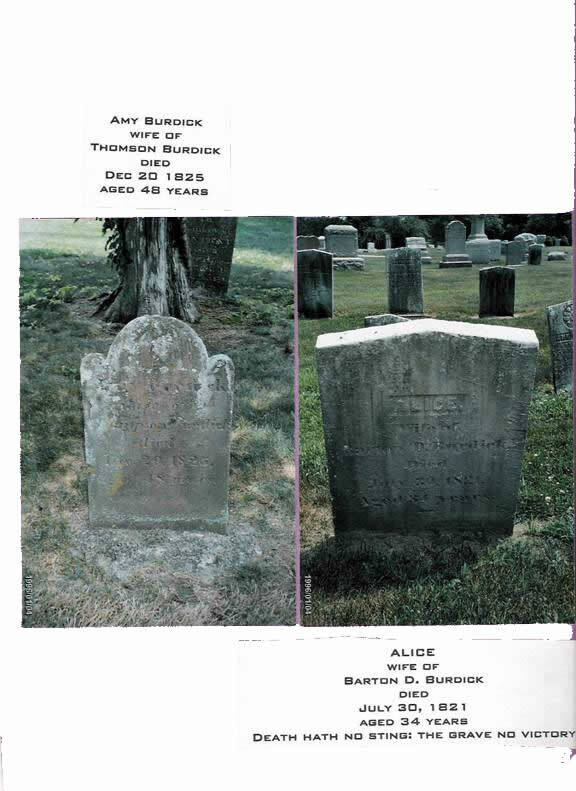 We found the headstone of Anna Babcock, and it mentioned Dr. Joshua Babcock on it as well. 1816: As of 1816 they still haven't adopted the official name 'Seventh Day Baptists'. 1818: In 1818 the name 'Seventh Day Baptist' was officially adopted as the name of the Church instead of the Bible name, ' Church of God .' It was also in 1818 that they reached their highest membership level with nearly 2,000 members in Hopkinton , Rhode Island alone. Meeting-house Bridge, 2 miles from the cemetery ( Hopkinton Cemetery , original location of the meeting-house), is where they brought everyone to be baptized. This bridge was the only crossing of the Pawcatuck River from Connecticut into Rhode Island (at this point). People who lived in Connecticut had to walk up the Pawcatuck River 5 miles to cross this bridge to go to Church. Boom Bridge Road and Boom Bridge , 5 miles down the river, was a short-cut they used to get to services. Boom Bridge was originally a tree that had fallen across the river. Some would cross this tree and walk to services. People who fell in the water would show up wet. This is why, if you didn't show up at Sabbath Services 3 Sabbaths in a row, after the 3rd Sabbath all the ministers showed up at your house the very next day to ask 'why?'. What follows is the plaque we found next to Meeting House Bridge , adjacent to the Hopkinton Cemetery . 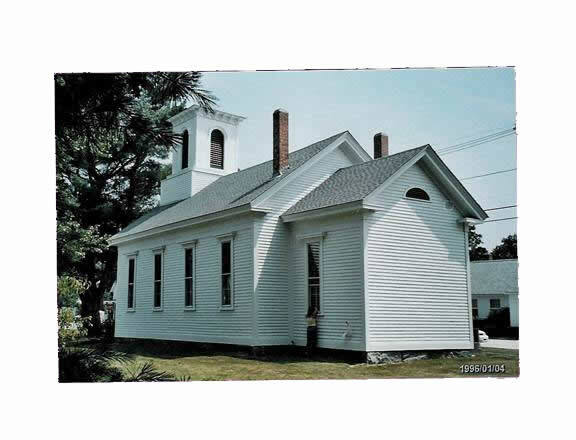 1835: This meeting-house they walked 5 miles to, the current meeting-house they meet in, was built in 1835 at the current location of the Hopkinton Cemetery . It holds somewhat less than 1,000 people. They sold pews to finance the building, so the people ended up owning their own pews. This caused some heated encounters when the Church had to disfellowship some members from time to time. How could you tell a person not to attend when he owned his own pew? It was now his own personal property. 1852: In 1852 they moved their present building (built in 1835) by dragging it on oxcarts 5 miles, from the cemetery in Hopkinton to its present location in Ashaway , Rhode Island .